The eighth section of Nathaniel Tarn’s sequence Dying Trees is titled “Unravelling / Shock.” Dying Trees was first published as a chapbook in 2003; later, in 2008, it was included entirely in Tarn’s New Directions book, Ins and Outs of the Forest Rivers. 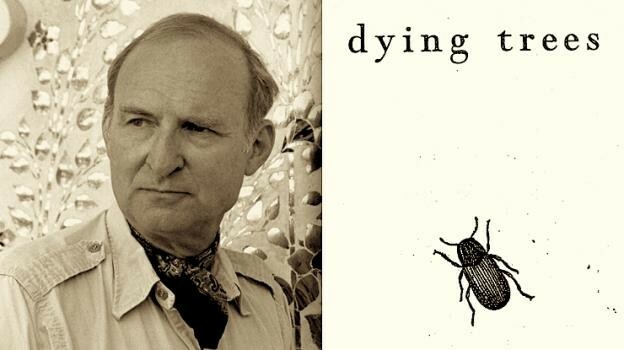 When the Dying Trees sequence was still unpublished, Tarn gave a reading at the Kelly Writers House (2002) during which he read several sections of the then-new poem, including the one discussed here by Marcella Durand, Burt Kimmelman, Erin Gautsche, and PoemTalk’s producer and host, Al Filreis. The setting is certainly Tarn’s parched American southwest. Drought is killing the trees; a cancer diagnosis is delivered; nationalism has brought more warring. The convergence of the three forms a “web.” “A hole [has been] torn in the fabric of the world.” News travels bodily; leaders fail to lead; beetles pierce bark; a demonic mouse – “wee” and yet terribly efficacious – compounds the morbidity to the point of body-snatching. It happens as an ecological, medical, and political simultaneity, and the speaker is not in a state to be much concerned about keeping the categories separate. Thus the poem is itself “the whole infernal weave” – a quality more obvious in this eighth section of the poem than in others.